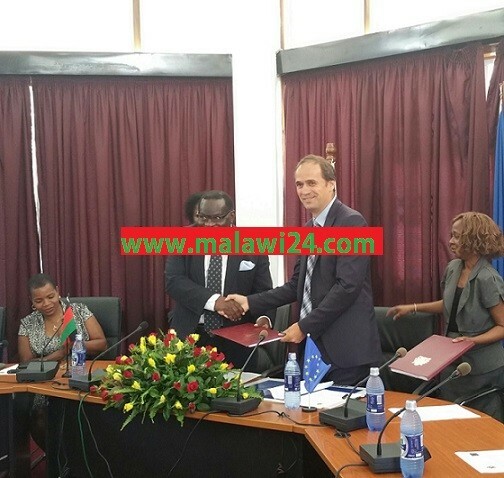 Head of European Union delegation to Malawi-ambassador Marchel Gerrman and Malawi’s minister of finance, economic planning and development Goodall Gondwe on Tuesday signed a 22.6 billion Kwacha project aimed at improving secondary education in Malawi. The project will among other things promote equitable education and relevance to secondary education through upgrading secondary school teachers’ qualifications among others. Gerrman and Gondwe during the meeting. Speaking at the signing ceremony, ambassador Gerrman applauded Malawi government’s decision to implement reforms in the education sector. “I commend the national education standards, rolling out a new secondary school curriculum and development of the education sector implementation,” Gerrman said. Minister of finance thanked the EU for the support and cautioned any mismanagement of funds by those that will be entrusted to manage the project. “Government will not entertain any misuse of the project resources,” said Gondwe. Through the project, 21 community day secondary schools will be rehabilitated and expanded with more classrooms, libraries and science materials, teachers houses and hostels. Dpp,2019 Bomaaaaa,otsutsa + Amabungwe mulira simunati. Mubeso ndalamazo agalu achabe chabe..
4n yanga ya zima eti!!!! something behind this for sure its lesbians n gay rights that mtalika is slory allowing it,,,,#crazy whites! That’s huge amount of money use it properly it can b one way of bringing back the lost donor confidence. Transparency and accountability should be the key in using the money. We want our secondary schools (public) to enroll both students from rich and poor families. It’s rare ti see a daughter of a Principal Secretary schooling at a public school because the standards have gone down due to massive negligence and lack of funding. Once more lets put the money to good use.